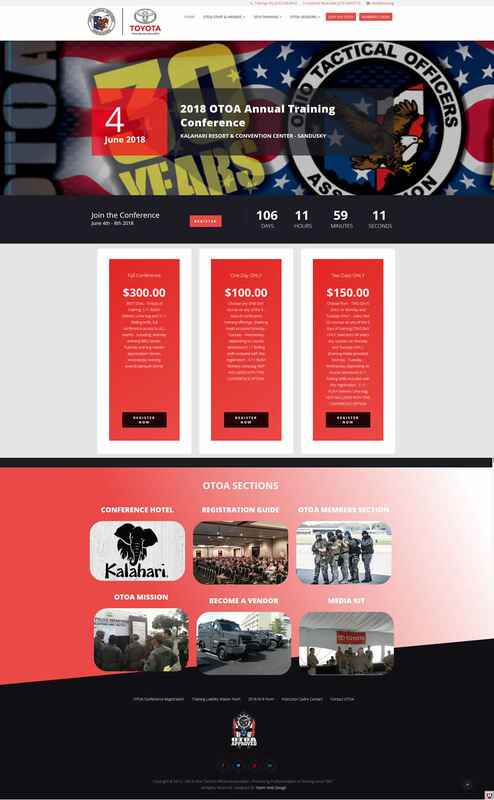 Objective: The client Ohio Tactical Officers Association wanted to create an event registration website to allow their 4500 members to register for their Annual conference and training courses. The website allows OTOA members to register for the conference and select individual certification courses. Once courses are completed the system generates certificates of completion for each course the police officers, SWAT Team members, and FBI Agents have completed. Tatem Web Design created an expandable CMS content management system to be able to encompass the many courses and conferences the organization offers. The client supplied the logo and the organizations colors to create the new website. The CMS system is fully expandable and a new website is being used daily to allow members to register for the classes and conference. We setup VPS hosting, user registrations and custom membership plans. We manage the website, registration component, the web hosting, website support. Tatem Web Design also donated a portion of the project to OTOA as they are a 501c3 organization and Tatem Web Design believes in supporting our police and other first responders for their important roll in protecting America and our freedoms.